**** Chosen by Winner: Aaron C.
Available with either a PlainEdge or fully serrated SpyderEdge (this is a plain edge), the Shaman’s blade is crafted from CPM S30V stainless steel and features a very high flat grind that balances strength, low-friction edge geometry, and an acute, utilitarian point. Its signature Trademark Round Hole™ is fully accessible from both sides to support swift, one-handed opening with either hand. For tactical applications where light discipline is a concern, this version of the Shaman also boasts a non-reflective black Diamond Like Carbon (DLC) blade coating. 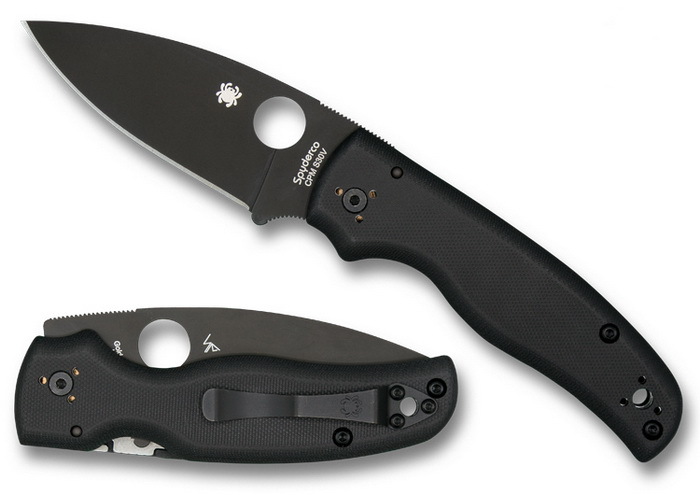 Spyderco was founded in 1976 by Sal and Gail Glesser. Initially, the company focused on selling our first product — the Tri-Angle Sharpmaker™— primarily at fairs and trade shows around the country.